To say I enjoy reading magazines is an understatement. 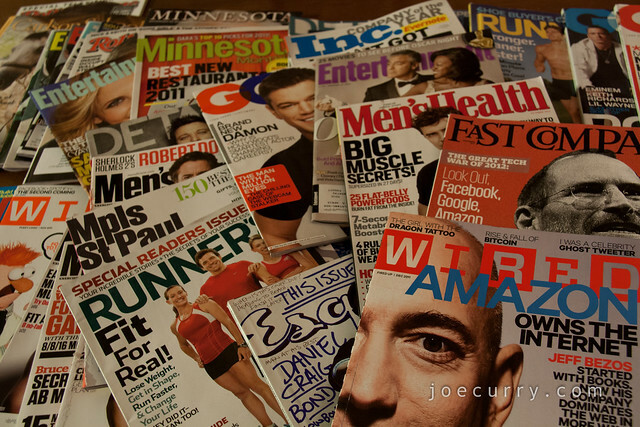 More accurately though, I subscribe to a lot of magazines. With my travel schedule (personal and work) the past couple years, it seemed more sensible to get a $10 subscription than pay $4.99 per magazine. But lately, there just hasn’t been much time to read them. I keep thinking that someday soon winter will actually set in. And, I’ll be ready. My 57 magazines and me. This entry was posted in Photography by Joe Curry. Bookmark the permalink.